At the Cascade Open House, Rob told me: "You need to join WetLeather. 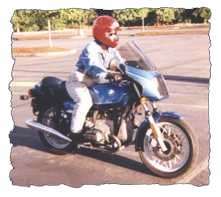 It's a mailing list of people in the Northwest who ride; it's a social group." I dutifully memorized the base URL: MicaPeak.com and added it to my "to do" list. I talked to MSF instructors at the Open House; got tips on various things; met Paul Baker, the owner; thought maybe Sean would now know who I was and that I was looking for a bike. I joined the WetLeather list (about the time of the 1998 Goat Roast, so it must have been late May/early June) and was promptly OverWhelmed! Who are these people? They talk (e-mail) a lot! I thought this was a motorcycle list .... half the talk has nothing to do with bikes! Fortunately (for me, don't know about for the list) Jim Horton came to my rescue. He wrote me offline and told me he knew me from another list, NetTrain, where he lurks. He also happens to be one of the BMW airhead gurus, so I was lucky in more ways than one! We both worked at Boeing; we planned a face-to-face meeting at the next VME (first Wednesday's, Vintage Motorcycle Enthusiasts). Also, Truman Grandy posted to me offlist, with a welcome. Although he was down Portland-way, he, too, was new to the list. I wasn't the only person swimming in a sea of names without faces! I'd found an R65 for sale at Gina's BMW in Iowa (Iowa?). Jim suggested I ask WetLeather if anyone had dealings with them; Jim Franklin related a story of a friend's experience that put a damper on this idea. Plus, buying without seeing the bike. And I wasn't crazy about the color (teal). Somewhere in here I 'met' Beth Dixon (a WetLeather dean in SFO) and joined the Short Bikers List (and couldn't keep up with it either, even though its traffic is nothing like WL). I mentioned to Beth that I was looking for an R65 and if she saw/heard of one, would she please keep me in mind. So when Tai Day, an SBL'er, said she had bought a Ducati Monster and was selling her R65, Beth did the electronic introductions. I'm "talking" with Tai when the proverbial showers arrive. Cascade takes delivery of an R65, same color blue. I agonize over this with Will, my mechanic buddy, over a beer or two. He finally says, in effect, "You're thinking too hard, Kathy. Just buy the bike in California!" So, even though I'd not seen this bike either, I knew the amount of work that the one at Cascade needed (which meant "project bike"). So, I made Tai an offer -- while on break from a ColdFusion class -- and a deal was struck. I was like a kid at Christmas! Anyway, the first thing my mother said was, "Well, I always wanted one." Cool! Dan, my SO who had been living in Southeast Asia for years, merely asked "Where did this impulse come from?" Fortunately, Paul Baker had commissioned a special MSF class for his customers. And he had some extra spaces. So I got a slot, as well as Mercedes -- one of the women I had met at the open house (who had recently moved from NJ with her husband and son). So a firm class date was set (SeaFair weekend AKA the first weekend in August) and the WL annual gathering was the following week. If all went well, Liberty thought my bike would arrive about the time of MSF . . .